The same Riverside construction paper you love now has a new name! 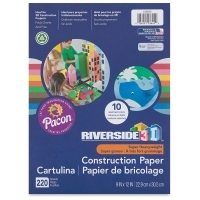 A practical choice for all-purpose classroom art paper, Pacon Riverside 3D Construction Paper is a heavyweight paper that’s strong enough to hold up to the most challenging crafts while adding dimension and strength to building projects. 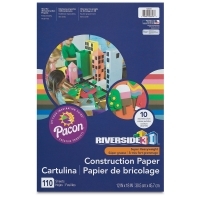 Made with 25% sulphite fibers that are longer and stronger, Pacon Riverside 3D Construction Paper won't fall apart when folded, or tear too easily, even when handled by the youngest artists. Brightly colored, with a soft, eggshell finish, this acid-free, environmentally friendly paper is made from 100% recycled content. Class Pack — Comes with two sizes of paper. 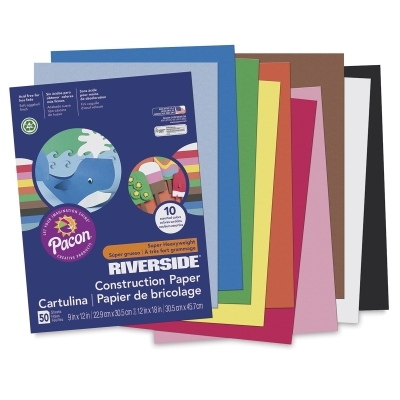 Includes 16 packs of 9" × 12" paper, and 4 packs of 12" × 18" paper. Each pack includes 100 sheets in 10 assorted colors, for a total of 2000 sheets! Color assortment varies per pack.